A Literary Odyssey: Shakespeare Reading Month: Coming January 2012. As man's ingratitude." (As You Like It: Act II, Scene vii). I am extremely excited to announce an event that I have been planning for a few weeks; a Shakespeare reading month taking place in January 2012! 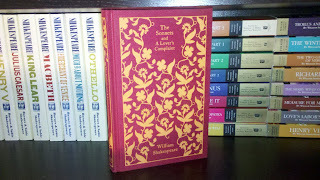 I am a huge fan of the Bard and have been since I started reading his plays in high school. And while I certainly agree that there is nothing like seeing one of his plays performed, I love being able to sink my teeth into the language of his plays. There is something about seeing the words, reading them, and absorbing them that gets me every time. And, since I have a big chunk of Shakespeare's plays on my list, I have been pulling my hair out trying to come up with a way to read a larger chunk of them (considering how many are on my list (16), I am a little behind in my reading). Since I failed at reading a bunch of his plays for the readathon, I figured a themed month would be best. And what time would be better to curl up with the Bard and his lovely language than in winter? After pitching the event on twitter, well, here we are! As you can see by my bookshelf at right, I have a lot of Shakespeare's works in single volumes (and yes, the shelf above houses my Penguin clothbounds). 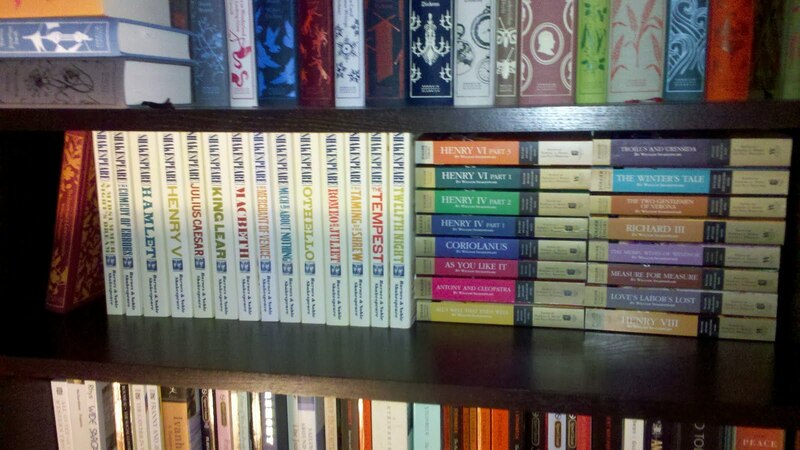 I am close to owning every play in a single edition in my quest to read all of his works. Yes, I take my Shakespeare very seriously. But, I need company in reading some of his plays, so this is where you come in. I am going to host sign-ups here, on this post, until December 31. To sign-up, all you have to do is comment below saying that you want in. A post on your blog discussing the event, or a tweet would be wonderful too! I will make a list with bloggers participating at the bottom of the post. Both are brand new editions I picked up somewhere (I have a habit of buying doubles). This would be a great way to add to your own collection of Shakespearean works as well as having two more plays to read in January! I will still accept sign-ups after December 15, but you will not be entered to win the two books above (mainly because I want time to mail them out to the winner before January). Then, during the month of January, all you have to do is read anything Shakespeare! Besides his plays, you can read some of his sonnets, a biography, a book about Elizabethan times, or even a play by one of his contemporaries (Marlowe, anyone?). The goal is to learn more about one of the greatest English writers and spread the knowledge. I will have posts throughout the month on the plays I am reading, as well as trivia, jokes, Shakespearean insults, quizzes, etc. The best part will be the master post for all of the bloggers participating. Each time you finish a work by Shakespeare, or about him and his time period, you will link to the master post. And each time you link, well, you are entered to win a final grand prize. 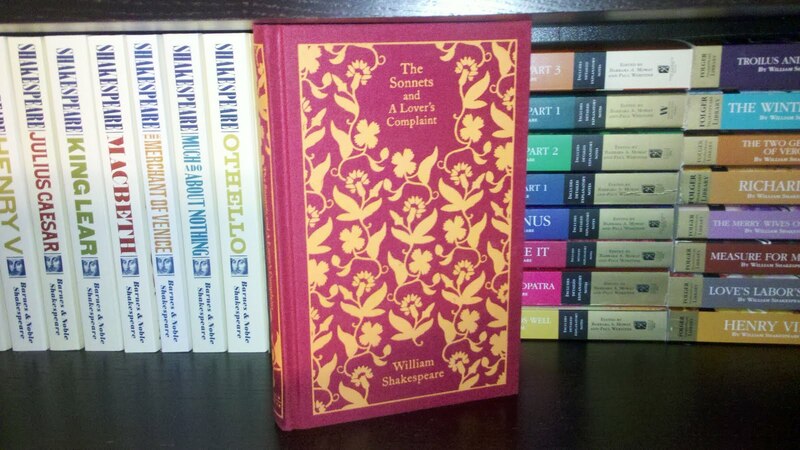 At the end of the month, I will choose a random number from the posts submitted, and the winner will receive a beautiful Penguin Clothbound of Shakespeare's Sonnets and A Lover's Complaint (my own edition is seen at right). So, the more you read, the more chances you'll have to win! I hope you'll think long and hard about participating. It is going to be a wonderful time, with lots of good reading! Comment here with your intentions to participate. Write a post or tweet (if you wish) about the event. At the end of the month, cross your fingers for a chance to win a Penguin clothbound of Shakespeare's Sonnets and A Lover's Complaint! "Winter, which, being full of care, makes summer's welcome thrice more wish'd, more rare." (Sonnet LVI). hi! i think this is just the thing i need to ensure that i up my shakespeare tally. also, i read the play that a comedy of errors is based on so i am pretty excited about that. Are your giveaways international? Count me in! And I'd love to know what you are planning to read in January...or are you going for all 16 on your list! I would be impressed! ok, I'm in! I'll start by the Tempest. thanks for this great 2012 challenge. on my way to tweet it around! I am aiming to read Coriolanus with the upcoming film release. So I think I shall join you in this event! I'm joining (of course!) and posted my plans for the event a couple moments ago. Thanks for hosting, Allie! I can't wait!! I'd love to be entered for the cloth bound of the sonnets, though, whenever that happens! Have a good week, Allie! Yes! I would love to participate in this. I'm going to get my husband a bunch of Arden editions for Christmas, so I am going to read some of those ... haha. For those who asked, YES, the giveaways are international! I have not read any Shakespeare in quite a while, I am definitely in. Great idea! This is perfect. I have most of January off and I have always meant to read more Shakespeare. Thanks for the challenge. Have done my post and linked to this on my sidebar. Not sure I definitely want to join in but I'm almost positive I would. If I do, please don't include me in the prize draws, however. I am participating for the sheer pleasure of it. I'll post about the challenge in my regular blog later this morning and you'll very likely see me leaving links to posts about . . . let's see . . . Henry V, Henry VI (all three parts), Richard III, and Henry VIII. I've been meaning to finish up reading all of Shakespeare's histories and this would be the ideal way to get that done. Do you recommend a certain publisher/edition of Shakespeare's work? 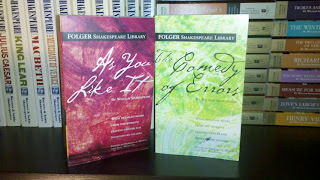 I know you like both Folger's and B&N, do you like one more than the other? I don't know if I'm noisy enough to count, but I'll certainly read along with you, and even try at building the courage to post up now and then. I was kind of thinking of doing a Shakespeare September thing, but I'm more likely to actually *do* this, so count me in! I'm planning on reading Othello for the Back to the Classics Challenge, so I'll start there. I am awfully tempted but I think I'm full up for 2012 challenges! Darn. Thanks for organizing this, Allie! I had already planned to read many of Shakespeare's plays in 2012, and I'm doing a long-term feature on my blog with his sonnets, so this works really well for me. As I have a complete collection of the plays, sonnets, and poems, please don't enter me in your give-away. I am sure that there are folks out there who don't have them yet, and would love to have the chance to win them. I think it is terrific that you're making them available! I'm in, I know I can get to at least one Shakespeare play, but hopefully multiples. Yay for the Bard! I really waffled on this for a while, as I'm avoiding challenges and such next year, but I think this will really fit nicely with my plans for next year. Looking forward to it! I'll definitely take part. I'd really like to properly read Shakespeare. I see the plays, and have read them in school, but I've never sat down myself to read. I will take part and will try to do as well as I can. I am busy in January so I may only manage one, but I will try to do at least three! I've been hoping to get to a few of Shakespeare's plays. I'm going to take part in this. Count me in too. I've been meaning to read some of Shakespeare's sonnets so that's definitely something I want to do. Also planning on tackling 1 or 2 of his comedies. I'm trying to avoid signing up for too much, but this I can't resist. I've had my eye on a couple of books about the man and his times at the library, and I would like to read a play as well. 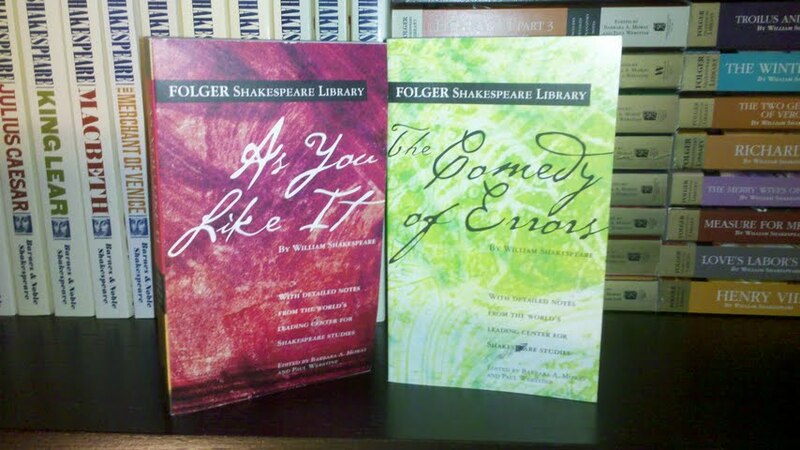 I read both Folger's and B & N editions. I read some Oxford editions back in college, which I sadly sold. I mainly collect the two sets I do because they are easy to find, accessible, and have a similar format. 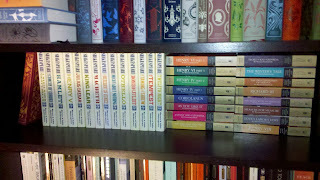 I really liked my Oxford editions, but they are hard to find in these parts. Remember, anything ABOUT Shakespeare also counts! I'm definitely signing up for this. I haven't had enough Shakespeare in my life lately! Awesome! I've been trying to make myself read some more Shakespeare, this is the perfect opportunity. Will definitely sign up for this. I've been meaning to start reading him, but never had the appropriate push... thanks! I'm in. Sounds like just the push I need to read more of his work. I'm in as well and will post about it on my Dear Helen, Dear John blog soon. Thanks for hosting this! It sounds like it is going to be a lot of fun. That's exactly the opportunity I need to deepen my knowledge about my most beloved English poet. NO ONE writes like Shakespeare, his language is absolutely unique and oh so beautiful. Thanks for hosting this! A sign up post will follow tomorrow. what a great way to start the new year.Shakespeare count me in. I've always found Shakespeare to be a little intimating but I think this will be the push I need to give him a try. I'm in, and thanks for hosting! I'll plan on reading Othello. Looking forward to reading some Shakespeare next month! Thanks for hosting this event. Ahhhh Finally my dreams have been answered! :) I'd love to take part, Wish it was January now. I'm in. It's a goal of mine to read all the comedies and tragedies over the next year. I would love to participate, Allie! I will probably only manage one play but that is still good, right? Right? I can't wait for January! Hi! Hope it's not too late to sign up for the Shakespeare Reading Month. I have posted about it on my blog. I have also tweeted. I'll join the party! probably with Richard III or (maybe and, let's see) Much Ado. It's a great idea, thanks for organizing! I plan to participate and have already started A Midsummer Night's Dream. I have been intimidated by Shakespeare so am looking forward to getting out of my comfort zone and learning a lot. It this goes well, I may commit to the 12 plays in 12 month challenge. Thanks for organizing! Is it too late to join? I'm going to read at least Romeo and Juliet and Coriolanus. Thanks for organizing this, Allie! I read The Tempest. Thanks again for hosting this! I finished Much Ado About Nothing. Thanks again! I read Sonnet 18, just because I think it's one of the must reads if you're talking about Shakespeare.